Honorable mention, Second Annual SUSNFS Photo Contest, 2006. T-45 Goshawk over Key West. Photograph taken by Flight Surgeon Lieut. Daniel R. Fulk. Third prize, Second Annual SUSNFS Photo Contest, 2006. 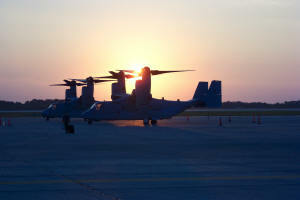 VS-22 Osprey at sunrise on Randolph AFB. Photograph taken by Flight Surgeon Lieut. Matthew Harris. Honorable mention, First Annual SUSNFS Photo Contest, 2005. Phone talker on USS Nassau (LHA 4). Photograph taken by Flight Surgeon Lt. Cmdr. David C. Kleinberg. Third prize, First Annual SUSNFS Photo Contest, 2005. C-130 Hercules on the night ready. Photograph taken by Flight Surgeon Cmdr. Frank A. Chapman. 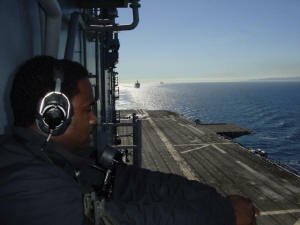 Flight deck operations on the deck of aircraft carrier USS Dwight D. Eisenhower (CVN 69). Photograph provided by Flight Surgeon Lt. Cmdr. Walter W. Dalitsch III. For the person who likes to fly and wants a bit of adventure, being a naval flight surgeon presents numerous opportunities for new and unique experiences, travel, and individualism in the daily practice of medicine. Most importantly, the practice of medicine with the operational forces qualifies you to say that you are in the Navy. An operational tour gives you an understanding of sea power and the problems of Sailors and Marines that cannot be taught in the classroom. Leadership, initiative, self-assurance, planning ability, foresight, teaching ability, and organizational skill are all required of the physician working with the operating forces. After one tour in the naval aviation community, you will remember your association with this achievement-oriented, highly competitive group of individuals as one of the highlights of both your military and medical careers. The naval flight surgeon practices preventive medicine first and foremost. He or she is the natural interface between the practice of medicine, the science of safety, and the profession of aviation. Through successful aviation medicine programs the flight surgeon promotes aviation safety, decreasing the potential for aircraft accidents. This is accomplished by a dedicated search for those problems - physical, mental, environmental, and man-made, which compromise safety in the air and in the workplace. To accomplish the job, the naval flight surgeon makes regular visits to squadron spaces, constantly assessing squadron esprit, safety consciousness, and the mental health of the aircrew and critical support personnel. Additionally, the flight surgeon flies with the squadron as aircrew to observe in-flight stressors and crew coordination. The process of promoting safety begins with the uncompromising selection of quality personnel. It extends through their training and into the fleet workplace, including the ground support personnel who ready the planes for flight. The training of a naval flight surgeon, therefore, includes subjects ranging from the physiology of flight to industrial medicine, environmental hazards and the investigation of aircraft accidents. The responsibilities of a naval flight surgeon in today's fast-moving, highly sophisticated operational forces are broad and ever-changing. The naval flight surgeon recognizes that safety hazards do not come to the clinic for identification but must be sought out. Thus, the establishment of good rapport with operational personnel is essential to safe completion of the operational mission. The Naval Flight Surgeon Course is designed to prepare Navy physicians for duty with the operational forces of the Navy and Marine Corps aviation communities. The graduate of the program is expected to practice this aeromedical specialty in an operational setting with the purpose of ensuring combat readiness of the unit. Preventive medicine, primary care, contingency planning and medical administrative duties, whether ashore or afloat, are all important roles that the naval flight surgeon can expect to perform. The Navy's flight surgeon training course is twenty- four weeks long. Classes convene three times a year at the Naval Aerospace Medicine Institute. The first nine weeks are spent in the classrooms and clinics on the campus of NAMI. Intense didactic instruction in environmental physiology familiarizes the student to the physiologic stresses imposed on the aviator in flight. An operational medicine overview covers topics that are pertinent to not only aviation but to all military medical assignments, augmenting the flight surgeons understanding and appreciation of the mission of the Navy Medical Department. Clinical aeromedical topics in internal medicine, neurology, psychiatry, otorhinolaryngology, and ophthalmology provide the flight surgeon with the understanding of how the aviation environment can affect the physiologic and pathophysiologic processes of the human body. The second phase of the course is a six-week flight orientation and ground school at the Naval Aviation Schools Command. Basic ground school topics include aerodynamics, engines and systems, navigation, and weather. Also included is basic water survival and aviation physiology training. This six-week phase of instruction for the flight surgeons are the identical classes being taken by all Navy and Marine Corps aviators. 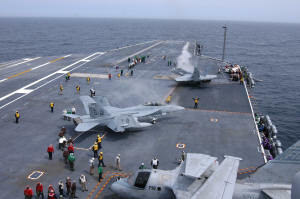 The third phase of instruction is a ten-week flight indoctrination syllabus with Training Air Wing FIVE at Naval Air Station Whiting Field, Milton, Florida. Training is conducted in the fixed-wing Beech craft T-34C (Turbo Mentor) and the Bell TH-57 (Jet Ranger) helicopter. The primary goal of flight training is to expose the student flight surgeon to the hazards and stressors of flight from the perspective of the aircrewman. Each phase of the flight surgeon's training satisfies a need for knowledge and experience which assures his or her credibility in the line aviation community. It provides the background necessary to provide essential aeromedical insight into aviation safety and to establish good rapport with squadron personnel, thereby, increasing the effectiveness of the flight surgeon in his or her assignment. A minimum two-year utilization tour is required after training. This allows the new flight surgeon time to practice and perfect their newly acquired skills. There are more than 260 flight surgeon billets in Spain, Italy, Japan, Bermuda, the United Kingdom, and all over the United States. Normally, a list of available billets is announced about midway through the six-month course. For more information, see the the web page at the Naval Aviation Medicine Institute. First prize, First Annual SUSNFS Photo Contest, 2005. 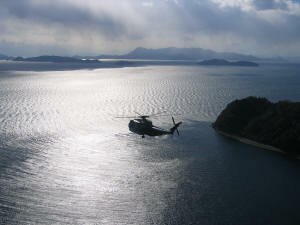 CH-53 Sea Stallion flying near Iwakuni, Japan. Photograph taken by Flight Surgeon Lieut. Peter N. Lombard. Second prize, Second Annual SUSNFS Photo Contest, 2006. 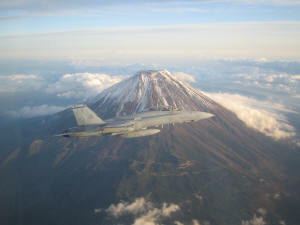 F/A-18 Hornet over Mt. Fuji, Japan. Photograph taken by Flight Surgeon Lieut. Matthew W. Lawrence. Sunrise over Rio Madre de Dios in Peru during Military Tropical Medicine Course. Photograph taken by Flight Surgeon Lieut. Kathy Tieu. 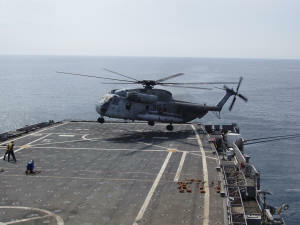 CH-53 Sea Stallion landing on the deck of the USS Juneau (LPD 10). Photograph taken by Flight Surgeon Lieut. Christopher M. Shale. Orientation of the Korean DMZ, with North Korea across the river in the background. Photograph provided by Flight Surgeon Lt. Cmdr. Walter W. Dalitsch III.